The homeowners wanted a sleek, modern kitchen that didn’t feel cold, so we opted for warmth and light. This traditional Tudor Manor is updated with a muted palette of creams, taupes and greys to create an atmosphere that is warm and inviting. The muted tones are present in the new teak floors, the custom cabinets, the granite island and ceramic tile backsplash, as well as the new furniture, making a multifunctional back drop for entertaining family and friends. The Wolf range and hood are nestled in the corner for a dramatic transition from the built-in refrigerator and ovens on the left, to the quartz countertop and sink on the right. The large stainless steel Blanco sink with an integrated strainer has a contemporary faucet with a sleek gooseneck spout that is high enough to accommodate the tallest pot. 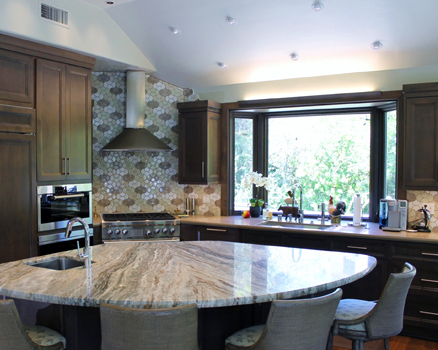 The large, fan shape granite on the island provides a work surface that is handy from both sides of the kitchen, and provides seating for family and friends to hang out. All 3 sides of the island provide storage. The Blanco sink is integrated into the surface nearest the refrigerator as a prep area. The new dining table anchors the alcove and is surrounded by the expanded glass windows and French doors that bring the grand oak trees into view as if you are living in a park. The contemporary rattan chairs are upholstered in chenille fabric from Perennials. The ceiling was raised to capture the vaulted lines of the roof. New recessed LED fixtures provide spot and flood lighting.